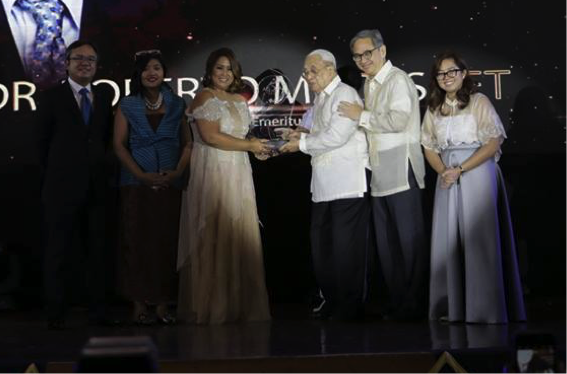 Dr. Roberto Macasaet Sr., Maxicare Healthcare Corporation’s Founder and Chairman Emeritus, has been awarded with the Outstanding Achievement in Entrepreneurship (Large Scale) at the recently concluded Philippine Marketing Association’s 38th Agora Awards. The awards night was held at the Maynila Ballroom of the Manila Hotel last November 9, 2017. Now on its 38th year, the Agora Awards recognize individuals who have demonstrated excellence in the field of marketing in the Philippines. They have been running since 1979, and have been held by the Philippine Marketing Association, who aims to promote the science and ethics of the marketing profession, and uphold corporate social responsibility and corporate citizenship. Dr. Macasaet has been instrumental in shaping the way the Philippine healthcare industry does business today, through his founding of one of the first Health Maintenance Organizations in the country. He is responsible for introducing healthcare services that have allowed for more flexible options for Filipinos of all income levels and employment. His achievement is truly worthy of recognition, not only showing exemplary business prowess but also a genuine love and concern for the Filipino people’s welfare. He is also a medical professional by trade, having received his medical degree from the University of the Philippines, and having trained at Fordham University in General Surgery, Urology, and Pathology. He was head of Makati Medical Center’s Department of Urology for three decades, and is currently a member of that hospital’s Advisory Committee. He also serves as chairman of Associated Medical and Clinical Services, and was previously chairman of Fil Hispano Ceramics, Inc. When Dr. Macasaet founded Maxicare in 1987, the HMO industry was practically nonexistent. Today, it has evolved into the leading HMO in the country, and has the widest network of providers with over 1,000 partner hospitals and clinics, and over 56,000 affiliated physicians nationwide. Under his guidance and business acumen, Maxicare has introduced such innovative products and services such as: the Maxicare Multifunction Card, the only HMO membership card that also serves as a lifestyle privilege card and EMV-enabled cash card; the EReady and MyMaxicare Lite, the very first prepaid healthcards in the industry; and the 24/7 TeleConsult Service, allowing Maxicare members to contact a doctor anytime, anywhere, without incurring deductions on their benefit limits.